KAISERSLAUTERN, Ger­many — As Army Sgt. Mark Arnett wraps up his tenure here teach­ing kids about the dan­gers of drugs and alco­hol, he can look back know­ing he made an impact on children’s lives. For the past two years, Arnett has taught the Drug Abuse Resis­tance Edu­ca­tion pro­gram in the Kaiser­slautern Mil­i­tary Community’s fours ele­men­tary schools. Army Sgt. Mark Arnett and Army Spc. 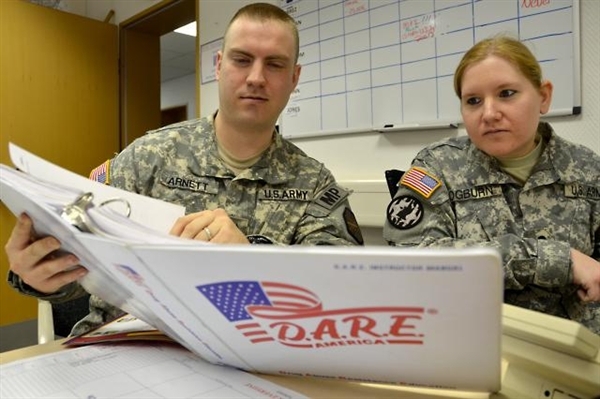 Kathy Ogburn, mil­i­tary police offi­cers assigned to U.S. Army Gar­ri­son-Kaiser­slautern, Ger­many, exam­ine a les­son plan for the Drug Abuse Resis­tance Edu­ca­tion pro­gram. Nation­al D.A.R.E. Day was April 7, 2011. “It’s been great for me to see the dif­fer­ence D.A.R.E. is mak­ing in kids’ lives,” Arnett said. “The light bulb goes on and the wheels are turn­ing,” he said of how quick­ly chil­dren under­stand the mes­sage about the risks of drug and alco­hol use. Since 1983, D.A.R.E. has taught mil­lions of stu­dents world­wide about the dan­gers asso­ci­at­ed with using alco­hol and drugs. Nation­al D.A.R.E. Day is observed each April in the Unit­ed States by a pres­i­den­tial procla­ma­tion, com­mu­ni­ty events and oth­er activ­i­ties. This year, Pres­i­dent Bar­rack Oba­ma declared April 7 as Nation­al D.A.R.E. Day. It’s been a few weeks since Arnett taught his final D.A.R.E. class here. He departs Kaiser­slautern soon for Fort Knox, Ky., where he’ll serve with the 1st Infantry Divi­sion. Mean­while, Arnett said when kids see him in the Kaiser­slautern com­mu­ni­ty, they ask him to come back. “That’s reward­ing, to know that they learned and that it was a fun expe­ri­ence for them,” he said. Dur­ing a pre­vi­ous duty tour at Joint Base Myer-Hen­der­son Hall, Va., Arnett donned the McGruff the Crime Dog suit and shook hands with kids. He had nev­er been in front of a class­room, but in becom­ing Kaiserslautern’s D.A.R.E. instruc­tor, Arnett learned the sub­tleties of teach­ing. “As a sol­dier, you instruct your peers,” he said. “It’s total­ly dif­fer­ent in front of fifth graders, try­ing to get them to lis­ten to you.” Depart­ment of Defense Depen­dents Schools stu­dents here com­plete 10 lessons over sev­er­al weeks, work­ing from D.A.R.E. plan­ners, Arnett said. Week­ly lessons include stu­dents act­ing out skits on peer pres­sure and watch­ing videos about the dan­gers of drugs and alco­hol. In Europe, where beer and wine are often part of the local cul­ture, alco­hol is eas­i­er to obtain at a younger age. Chil­dren liv­ing over­seas know that, Arnett said. “We stress the impacts alco­hol has on young bod­ies, the adverse effects that it can have,” he said. “Kids are pret­ty smart. They know it’s bad for you, just not how bad it can be.” What kids learn in D.A.R.E. can have a rip­ple effect with­in their fam­i­lies, Arnett said. One Kaiser­slautern fifth-grad­er recent­ly brought her lessons home and helped her moth­er quit smok­ing, he said. Staffing a D.A.R.E. offi­cer for Kaiser­slautern Mil­i­tary Com­mu­ni­ty schools make sense, as police in mil­i­tary com­mu­ni­ties mir­ror the work of their civil­ian coun­ter­parts, said Mas­ter Sgt. Ken­neth Pry­or, U.S. Army Garrison-Kaiserslautern’s provost sergeant. “It gives us an oppor­tu­ni­ty to have an offi­cer go into the class­room, so the kids don’t just see a police offi­cer as a cop,” Pry­or said. “It human­izes the indi­vid­ual.” In Feb­ru­ary, Lt. Col. Kevin Hutchi­son, com­man­der of U.S. Army Gar­ri­son-Kaiser­slautern, spoke at the Kaiser­slautern Ele­men­tary School grad­u­a­tion. He thanked Arnett for his efforts in mak­ing the D.A.R.E. pro­gram a suc­cess. “He is the face of D.A.R.E. in our com­mu­ni­ty,” Hutchi­son said. Arnett will pass the D.A.R.E. teach­ing reins to Army Spc. Kathy Ogburn. In less than four years as a mil­i­tary police offi­cer, Ogburn has served at Fort Hood, Texas, and helped train local police in Afghanistan. She said she’s excit­ed about tak­ing on new chal­lenges here.